Always check your water temp before adding yeast – think Goldilocks, neither too hot nor too cold! Too cold and your yeast won’t proof, too hot and you’ll kill the yeast off so no proofing there either. A nice, lukewarm or room temperature is what you’re looking for for perfect proofing. BONUS: because this is a flatbread, it requires little kneading and only a 30 minute rising time. Also important, this is a recipe that needs you to use your hands. Get right in there to mix everything together – a great recipe for little hands to learn in the kitchen too! Combine water, yeast and sugar in small bowl or cup. Set aside to proof for approx 15 minutes or until foamy. When yeast has proofed, add to dry ingredients and mix just to just slightly combine. Add olive oil and mix until all ingredients are completely combined and a somewhat raggedy ball of dough forms. Turn ball out onto a floured surface and knead for approx five minutes. You’ll feel the dough becoming more elastic and smooth as you work it. Return kneaded dough to a large bowl, cover with dishcloth and allow to rise for 30 minutes. Turn out onto floured surface, punch down the risen dough just slightly and cut into 8 equal pieces. A dough scraper works beautifully for this! Roll each piece into a small ball and set aside. With a floured rolling pin, roll out each of the balls of dough to desired size – ideally between 6 and 8′ in diameter. Heat a cast iron skillet, brush lightly with olive oil and cook pita one at a time for about 2 minutes per side. The bread should be just slightly browned – they will puff up a bit, that’s normal. Enjoy warm or cool and store, wrapped well. 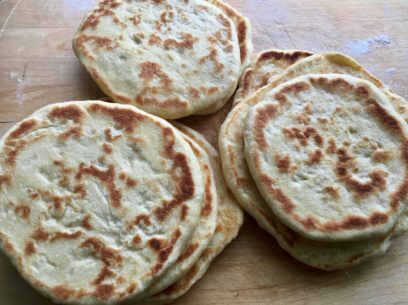 Hi, I have never made Greek pita, although I am Greek Thanks for the recipe. I will make it soon. Looking forward to trying this recipe. How much can I cut back on the salt? Thank you! Can’t wait to make them. Once refrigerated, how long do they last? and they freeze well, too! as health and the years now require. I think this would speak to a broad audience. Maria, other than suggesting Bob’s Red Mill 1:1 gluten-free flour, I’m not sure how much I can help here….. GF is not my area of expertise but I’d love to know – and share – your experience if you do try it! they made the pitas on the grill. So after making them fresh in the skillet would we put them on the grill ? so jealous you were in Xania this summer – such a wonderful place! Have you tried this recipe with other flours? I.e., would it be possible to substitute wheat or something whole-grain? Thanks for the recipe–I love its simplicity! Looks great and will definitely try this. How much is a cup in weight? average cup of flour comes out as about 120 grams. hope this helps! I like to use whole grain flours whenever possible. Could I substitute whole wheat flour, whole wheat pastry flour, or white whole wheat in this recipe? Or perhaps for half the flour? Thank You. I just found your blog this morning and though I’m not a vegan or even a vegetarian, I want to eat a more plant based diet. Your recipes look absolutely delightful. Can’t wait to try many of them. We make our pita on the newer version of the George Forman Grill. Works like a charm, cooks both sides at once; we use the flat plate on the bottom. I have the old version of that grill do you think I could use that to make this bread? I just made this for dinner and it was the perfect compliment to my Indian curry with rice dish. It’s chewy, soft and delicious. I used all purpose flour and only used 1 tsp olive oil. I also did not oil the pan because that’s how my grandma makes hers. Also I kept them wrapped in a kitchen towel while cooking the other ones and that made them soft and kept them warm longer. Thank you so much for the recipe! Just made a batch of these and they are fantastic. Quick and easy especially with the quick rise. Thanks!